PLEASE NOTE: The newsletter is obviously still a work in progress, thank you all for your patience while we get up to speed. 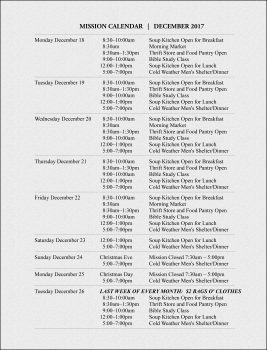 The daily calendar reprinted below details the holiday schedule, which differs in some details from the Mission’s normal hours. The January schedule will return to the familiar summary format. The new Director of the Silver City Gospel Mission is Amy Wagner and we are expecting some great things from her! Amy most recently ran a coffee shop and thrift store in Cliff, NM and enjoys crochet, painting and sewing, is a Christian and attends the Gila Valley Baptist Church. She has worked as a victims advocate at El Refugio, taught at a Head Start and worked at a safe house in Pine Top, Az. She was on our community committee that oversees our women’s shelter and she says that she is really looking forward to making a positive spiritual impact on the people we help. As for me, I will be remaining in our home town of Silver with my lovely wife who will continue with her work here in town and I will be taking a break to recoup from this gig. I won’t be around the Mission for the next few months, but I have been asked to sit on the Board in the future and it is an opportunity I will probably accept, as I still strongly believe in our cause. My hat is off to everyone who has helped us over the years, your names being to numerous to mention. Thank you very much for all of your help and support. In ‘Man’s Search For Meaning’, Viktor Frankl wrote that doing something to help others brings more meaning and joy to your life. When people start helping down here at the Mission, I’ve noticed that their lives have become richer and fuller because they have taken on more meaning as they learned to selflessly give to others. And I do notice these changes for the better daily in both our staff and volunteers. So I think we are on the right path. 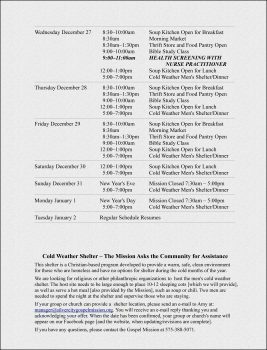 Statistics for last year show that You (our friends and neighbors in Silver City) fed 35,261 hungry souls in the soup kitchen, handed out 5,821 food boxes to families, helped 4,892 families with clothes, sheltered anywhere from 8-16 men in the cold weather shelter, 2-8 women in the Sierra House Women’s Shelter and the case worker helped 1,321 people. But more important than the numbers are the changes in the lives of those you have helped. Take for instance Angelica and her newborn who came to us without a place to stay soon after giving birth. We were able to help her out by providing all of life’s necessities and thanks to a grant from the United Way were able get her an apartment of her own after a few months. Or Franklyn who had drifted in from the deep South in the hopes of better job prospects. He was able to afford a small place soon after arriving but with no skills and an addiction problem he was unable to secure any employment and the money soon ran out as did his lease and he found himself on our doorstep. We were able to feed and clothe him, get him some help with his addiction and eventually secure some part-time employment and some odd jobs for him. With this small income, he was eventually able to secure another home with a couple of other fellows and last we heard he was doing OK.
Do people who are perfectly able to get a job take advantage of our services? Sometimes, but we try not to judge because in many (not all) cases we are able to motivate them and give them a little hope about a better life and we can move them further down their path. But it is still a balancing act in our quest to help our neighbors, having to juggle limited resources, legalities, personalities and various belief systems. But it is stories like those above (and these here) that truly give our lives meaning, make us better people and give us a sense of real joy. Thank you once again, Silver City for all of the help you so graciously provide; we couldn’t do any of this without you! Please give yourselves a pat on the back and take just a moment to reflect on the true hearts of service that beat in each and every one of you and truly give your lives some meaning and joy. 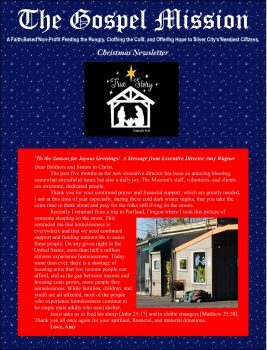 We spend a lot of time and resources at the Mission in our fight against hunger, cold and despair. We are trying different ways of feeding, clothing, inspiring and educating those who come to the Mission in search of the emergency services we provide and trying to find ways to help them get back on their feet and stay there. I was asked the other day how an individual could help improve the lives of the impoverished in our small town and have thought of a few ways that could make an impact on someone. Educate Yourself; research the causes of poverty and find out how in many cases it is linked to addictions, lack of education, mental illness or the criminal justice system and think of ways you can get involved in solutions to the major issues that we are putting a band-aid on. 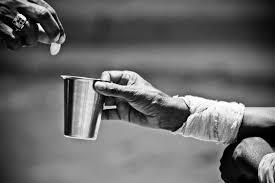 Help an individual that you know needs your help; direct them to the Mission, give them some food or needed items, offer them a simple job for cash, or even just talk to them and learn their story. Become an advocate for a good cause; do you see roadblocks in society that are preventing effective change from happening? Then try and do something about it by starting a petition, talking to your elected officials, getting your neighbors together for a discussion and educating yourself on current bills or laws. 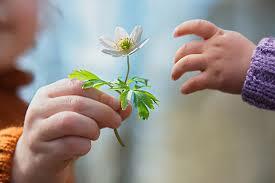 Start your own fundraiser or food drive; See a need that isn’t being met or want to lend a direct hand to an individual, family or organization? Start your own food drive or fundraiser. 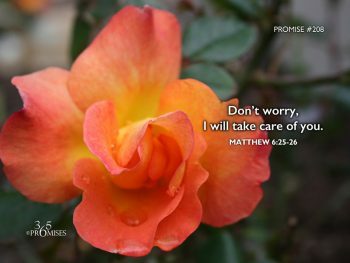 Pray for those in need; I left this for last in fear that I might lose some readers, but it should have been first. I am a firm believer in God and I do believe that if your are willing to ask/seek/knock you will be answered if you keep your eyes open.